When I search the Internet on my smart phone, I’ve noticed that I increasingly avoid sites that aren’t mobile friendly. It’s just an unpleasant user experience, so I bounce and find a site that offers a better mobile experience. There are plenty to choose from, and Google is favoring them more in mobile search results. So why squint and struggle when I don’t have to? Whether the pain is slow page load speed, a desktop site displayed (really? ), or bad mobile UX, I’ve noticed my tolerance is lower than before. It’s not because I’m in the business, it’s because I know from experience as a user that the good alternatives are abundant these days. I imagine I’m not alone. 2015 was the milestone year that mobile internet searches surpassed desktop. So it’s no surprise that Google announced in March 2016 on webmaster central that they’re “rolling out” an update to strengthen the mobile-friendly signal that began with their April 2015 algorithm expansion. Google says that if you’re already mobile-friendly, you won’t be impacted. And that your site may still rank well if you have “great, relevant content”, even if you’re not mobile friendly. 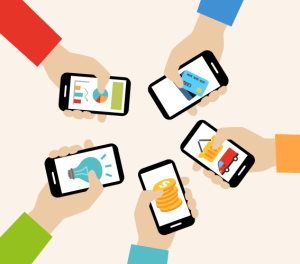 For Internet retailers today, mobile friendliness and mobile ease of use is critical. Have you ever tried to make a purchase with a mobile device on a site that’s poorly optimized for mobile? Argh! But the mobile shopping experience is improving rapidly. 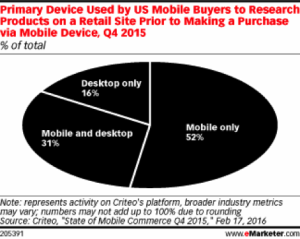 A new eMarketer study indicates 52% of Q4’15 mobile buyers conducted the WHOLE shopping and buying process on a mobile device! For now, search engines seem to be easing into mobile signal strength. But I doubt online shoppers are as lenient. Increasingly, I think they’ll leave your site in favor of a competitor who offers a pleasant mobile shopping experience. So it’s beyond time to get mobile friendly. And in doing so, focus on your visitors (not Google). Make the experience fantastic for them.